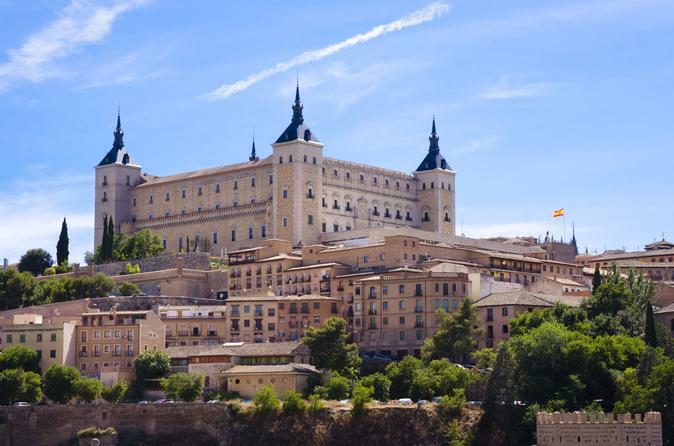 You will depart from Madrid on a comfortable private van to Toledo, before arriving to the city, you will make a quick stop in a viewer where you would see the landscape. The city of Toledo, known by many as the second Rome, was declared a World Heritage Site by UNESCO. During your tour you will have a panoramic visit to the Cathedral of Toledo, the Mirador del Valle, The Monastery of San Juan de los Reyes and Puente de San Martin. You will have a an hour and a half of guided tour by the streets and then you will have an hour of free time (own expense). Do not miss the opportunity to explore its narrow streets, squares and gardens. After visiting Toledo, you will head to Segovia where you will get to know the aqueduct, Alcazar and the Cathedral of Segovia. The aqueduct measured about 15 km and takes water near the actual marsh of Revega. You will have an hour for lunch (own expense) and then you will have a guided tour in the city. Your guide will explain the history of the city, the architecture and important cultural details. The last point of the visit is the Alcazar, and also at this point you will have some free time before taking the vehicle back to Madrid. There is no doubt this is a tour where you will learn a lot about architecture and construction on your visit to Madrid. This tour is 11-hours. Even though you are free to set the starting time, we recommend you to take the first schedule available so you can be getting back to Madrid at 7pm when it is not too dark to enjoy the rest of the night in the city. The van is for 8 people, you are free to decide how many guest will take the tour, the minimum is one person and maximum 8 people.